Home >> Lesson Plans >> By the Book -- Activities for Book Week! An anonymous quote says, "A book is like a garden carried in the pocket." But getting kids to crack open books is often no walk in the park! During this year's observance of Children's Book Week, share the wonder and magic of books in your classroom with help from a few great literary lessons. Included: Five language arts lessons you'll want to "bookmark"! Each May, the Children's Book Council (CBC) celebrates Children's Book Week. The CBC Web site offers many resources, including a History of Book Week and ideas for celebrating Book Week. 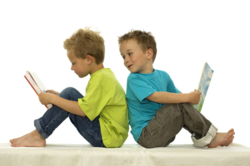 Are you looking for a way to motivate your students to read without throwing the book at them? The following lessons are sure to empty your bookcase and leave your bookends happily standing alone! For dozens of fun ideas for celebrating books and improving reading, be sure to see this Education World archive page.